While Blockchain world is on expansion with Zug, a town in Switzerland keen to establish itself as “Blockchain capital.” Or another European blockchain trading firm we.trade completing their live operations involving major banks and companies. Or the ongoing discussion of Blockchain establishing itself as an Operating system, the world is still perceived by its myths on Blockchain. Accept the fact that NOTHING in this world is free, so if you thought setting up a distributed ledger – block by block is free of cost, it is not. Blockchain although an open community needs miners to validate each transaction by solving the problem. The problem requires high computing power, and someone needs to pay for it. Amongst all the miner who gets the correct answer quickly gets paid, that’s how miners earn money by giving away the computational power. While Blockchain is a technology, Bitcoin is one of the use cases of that technology. Let’s take an example – assuming you a have log of wood, now that wood could be crafted as a chair or a table. Similarly, the wood, in this case, is Blockchain that has been crafted as Bitcoin. Blockchain technology is not restricted to any one sector, because of its basic nature of decentralization, distributed, immutable, historical, encrypted, could be customized as public/private it could be used across any sector, i.e., Health, Aviation, Energy, Telecom, Banking, etc. Are you trying to remove intermediaries? Are you dealing with digital assets? Would it be possible for you to create a digital authoritative record for the asset? Would you be fine with the slow/medium paced transaction? Do you want to rely on a trusted third party? Are contributors willing to contribute computing power or resources? 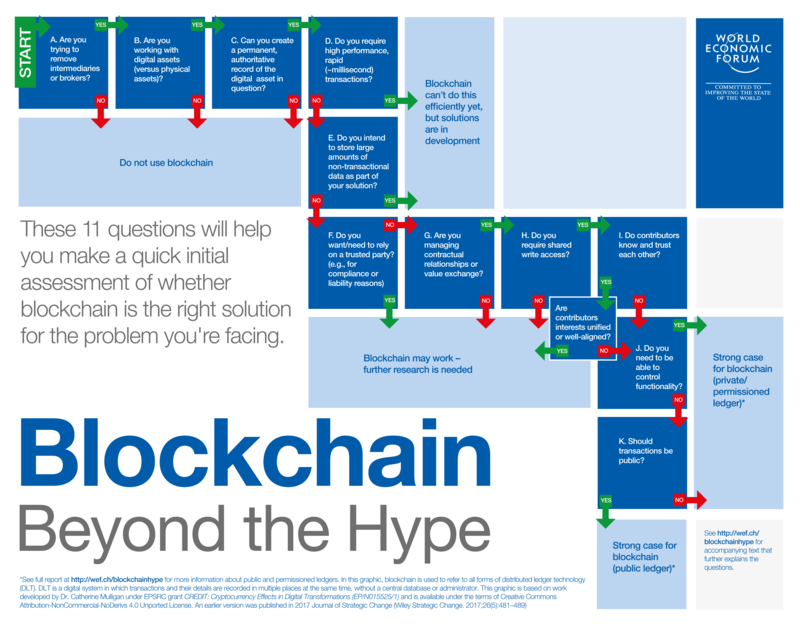 If you answered YES to all the questions above, your business may need Blockchain or else a decentralized system is good for you. Access the full questionnaire and image here.